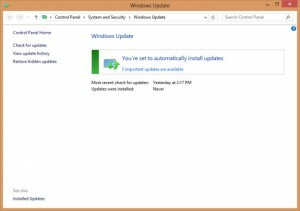 If you are looking to check Windows 8 updates then follow the steps below, at first, by connecting your computer with the internet. Go to start screen, click on the Desktop tile. Once the Desktop screen appears, place your mouse on the upper right corner to get the charm bars. Charm bars are one that appear when you click for it. In the charm bar click on the Settings option and from there select the Control Panel. Inside the control panel you will find all the lists of options. But you may not find the Windows update option there. To get Windows 8 update option write windows update in the search bar of the CP. A new screen will come where you will find the “Check for updates” option and click on it. The Windows 8 updates checking will take sometimes depending on your internet speed. If there are updates due then the checking will result in Orange colored message and if the computer is already updated then a Green colored message will appear. From the Orange colored message box, manually select the updates that you want to install to your system. However, above is the manual process. You can let the computer do the checking and updating at its own. To turn on the automatic updating of Windows 8, following the steps above. Once you reach the Control Panel (CP) you need to click for Windows Updates and there is the option to turn on automatic Windows 8 updating. Keep in mind that Microsoft recommends users to continue updating all its OS’s with all kinds of updates it releases. There is ideally nothing to preselect or choose from updates. Everyone require to get all the update releases. 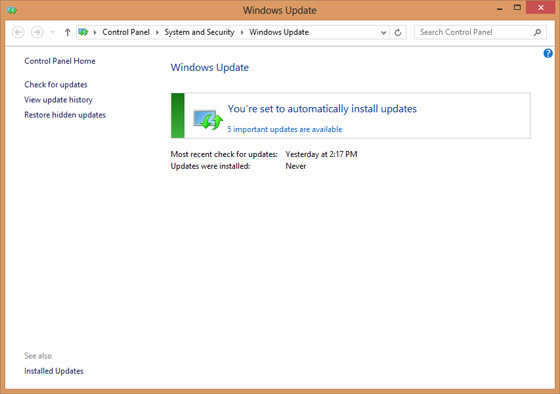 When you click on Turn On Automatic Windows 8 Update, you will have configure the update settings section. A new window will come where you can opt for the constant update, releasing yourself free from manually selecting the updates. That’s all. Enjoy.